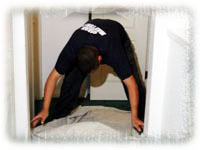 to resolve adverse conditions coming from your air vents. Call Machado now at 1 800 358-3828 and start breathing easier. 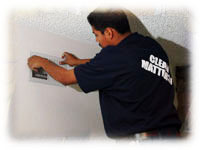 With over 30 years servicing your area, Machado is your Heating, Ventilation and Air Conditioning Cleaning professionals. Improve the hygienic conditions of your home. Often important for allergy suffers. 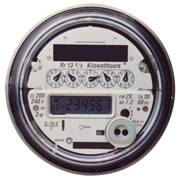 Improve system efficiency, which saves you money and reduces your carbon footprint. Improve the longevity of your system. Less stress on components makes the system last longer. 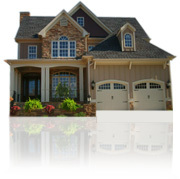 We recommend having your HVAC system cleaned every 5 years. This can vary with location and weather. It is usually helpful for allergy and asthma sufferers to have it done more frequently and certainly after any house construction work. You can always check to see if your system needs cleaning by shining a flash light through the vents and see if it looks dirty. You could even go as far as taking off the air vent - to get a proper look. Next is to get a quote. Call Nancy at 800 358-3828. How many vents do you have total. (Supply and return -blowing and sucking). Then she has enough information to give you a quote. First we remove all the vent grilles from the walls, ceiling, or floor. They are taken outside and washed. 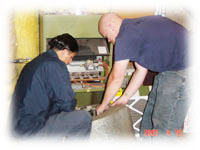 The blower housing is removed from the furnace and the blower wheel is then disassembled from the motor, washed (scrubbed if necessary), then reinstalled. The blower housing is also cleaned. We wash (not just blow off) the evaporator (cooling) coils, clean the heat exchanger, and thoroughly brush and vacuum the inside surfaces of the air-handling unit (furnace). Any fiberglass insulation exposed to the air stream is coated with a special encapsulant, which prevents fibers from coming loose and blowing into occupied spaces. A large, high-power HEPA-filtered vacuum collector is attached to the central duct system, which puts the whole system under a negative air vacuum. 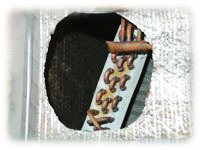 This means that the airflow is now reversed and air is being sucked back in through the vent openings instead of being blown out. All the vent openings are covered up, except for the one through which the cleaning is being done. One by one, the duct runs are all cleaned by inserting a rotary power brush (attached to a long, flexible cable) through the vent openings. As the brush spins and agitates the inside of the duct, the stirred-up dirt and debris is sucked out of the ventilation system and into the power vacuum collector. The power vacuum collector and hand vacuums are all fitted with high efficiency, surgery room standard HEPA air filters, so no dust, fibers, or germs are released into the living spaces. After all the ducts and the air-handling unit have been brush-vacuum cleaned, everything is reassembled, vent grilles are replaced, and the system is tested for proper function. All surfaces in the home are well protected with drop cloths and plastic sheeting, and special care is taken to leave the home in the same condition as found before starting the job. Vent grilles are carefully removed and reinstalled during the cleaning process, but in instances where the grilles and screws had been painted over, the customer may need/want to do some minor paint touch-up afterwards. We do not, as a rule, sanitize air-handling systems. 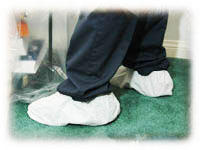 However we can, upon request, perform this procedure when necessary; e.g., if there are visible signs or other evidence of microbial contamination in the system, or if mold remediation has been performed at the residence.To eliminate smoke, pet, spoilage, musty and other foul odors we would deodorize which controls odors by both encapsulating and breaking down odor molecules, while time releasing a fresh fragrance. It is formulated with non-toxic and readily biodegradable ingredients meaning there is no need to evacuate the premises during application. However, we cannot guarantee to completely eliminate odors. The reason for this is the source of the odor may be within the walls, insulation, building materials, etc. and since a ventilation system moves air from all over a structure, the odor can appear to emanate from the air system. 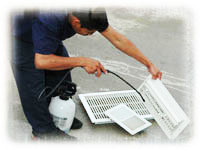 Outdoor condensing units are also cleaned. The area below the fan is accessed and thoroughly brush-vacuum cleaned. 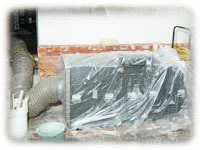 The condensing coils are washed down, removing any dirt or debris clogging airflow. This could result in significant energy cost savings since less electricity is used in the cooling process when the condensing unit is clean and airflow unrestricted. Nancy at 1 800 358-3828.